100 Years???? Obviously no bloggers among them! The question that runs through my head, is this: Do they really need to have a new Pope? We don’t have a Pope right now and no one is running scared. What would happen if they switched to a more emergent leadership structure? I know . . . too late, the wheels of church tradition are in motion and no one will stop that train . .. but when Jesus handed out the bread during the last supper, no one got a larger piece, not even Peter, and the idea seemed to be that Jesus was the head of his Body, His church, and leadership was dispersed in a way that allowed leadership to be exercised when it was called for and by the right people. 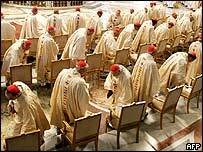 If the Vatican went emergent, the Cardinals would be ordering the big white hats to match their new empowerment and the PopeMobile would become a fleet of PopeSmartCars. It would kill the Vatican postcard industry, but the flow of power out to the Cardinals, Priests, Nuns, Monks and other leaders might be a solution to deal with our complex world. Sacreligious, perhaps. But worth a thought. We don’t have a pope right! Well maybe we do? We just won’t admit it. We often quote more from our favourite emergent bloggers than we do from Jesus himself! I know I’m just being silly, but it’s worth a thought?? there is something to be said for a system that has lasted the tests of time and winds of change (you can argue how successful they’ve lasted the test, but they have lasted). since quite a bit of emergent is changing the language inorder to change the perceptions, maybe they’d go emergent if they appointed an “abbot” or “papa”. silly fun, but worthy of thought. I thought James Dobson was the pope? No…well is it the guy who writes the Left Behind books? No…and it’s not George W.? Seriously though, perhaps the pope himself can appropriate power down through the ranks of cardinals, monks, nuns, etc. Perhaps the Vatican can become a “clearinghouse” of faith and Christianity that enables the flows, and the pope is respnsible for the systems. He would care for relationships and networks. The pope has the opportunity to affect the world and the Christian religion, it’s all about how that power is used. You can decentralize, but can the rank and file Catholic handle it? Would they know what to do? I also think decentralizing leadership in emerging churches (well, at least I can speak for the USA) may get messy when we start handing out responsibility to people who think they need a seminary degree or some kind of credentials to minister. I’m all for decentralizing, but not sure about the problematic trends to watch out for. I’d vote for sacreligious. The idea has it’s place but so does tradition. Plus, we don’t blog about something like this when it happens to Free Methodists or to Baptists…. Skinny for Pope! I agree. jordon, no disrespect intended . .
when i preached at a church a few days after John Paul 11 passed away, I dedicated the message to “Karol” and ended with the fine example of his end – his finishing well. I also love tradition (i am starting a celtic monastery, as you know) but also like to see things work and succeed. Well I must say I’m torn. In a way, I associate myself with the Larry Norman lyric about how if they [ie the vatican] want to feed the poor they should sell some of their gold. And maybe that is right – to a point. But maybe the anarchist in me is biased. Maybe I cannot disassociate the institutionalism (which I hate) from the good that is there. Maybe, in fact, I have no right to criticise Their Odd Ways when I replace them with My Odd Ways – their Pope when I replace him with My Pope. Roman Catholicism clearly works for a whole lot of people on many different levels. Jesus works through it. Let us pray that his will is done. Better still, lets just leave them to get on with it in peace. yes . . and better still, lets join them and other believers and the whole body of Christ in what He is doing on the planet today. I’ve always been curious as to how high some catholics put the Pope position. I realized how serious this subject can throw some people. Just the other day I heard someone say, “I hope that the new Pope will be able to express my view and show the world where the church is going.” This is where I just shut my mouth and pray for some people.